Because it includes some "adult language"
as a WM I use x11-wm/fvwm2, as a file manager/desktop handler x11-fm/pcmanfm, etc. and as a result - more usable. I am not using desktop environment. I use a window manager instead. In one of my machines, I use FVWM, on another CWM, plus a minimal set of programs just for me. I only try to use cli programs that are quick and unrelated to computer resources. I think that complete desktop environments is a waste of computer resources. FVWM is my WM of choice - Fast, Flexible and Fun. No desktop environment, prefer window managers only. Current one is x11-wm/cwm and I am really happy with it. In the office I have to deal with Windows most of the time. However I use WSL and scoop in powershell to make it more bearable and well most of my screens are terminals and vim, and my browsers always have a plugin installed for vim keybindings. At home I have a mixture of linux and openbsd and freebsd. On all of them I use openbox. I have my openbox config in git so I can grab it for any machine I am on. Typically it is openbox + tint2+ compton. I will mention to back openbox I add in xfce4 tools and fluxbox so Mod+E calls fbrun Mod+t opens XFCE4-terminal (used to use sakura) and Mod+s opens XFCE4-appfinder. I also have a couple other keybinding tweaks I picked up over the years for some semi tiling behavior like docking a window left or right. If it is a computer the rest of the family uses, and they are more mouse oriented, I install gnome3 or cinnamon for linux machines and use gdm, for freebsd I find kde5 + sddm better thus far. My only gripe on the sddm side is it only remembers the overall last wm choice not the last wm choice of the user signing in. On FreeBSD: I regularly use whatever the latest plasma5-plasma version is, with konsole, dolphin and a few other things added, or occasionally I use LXDE for server configs because of it's lower resource consumption. 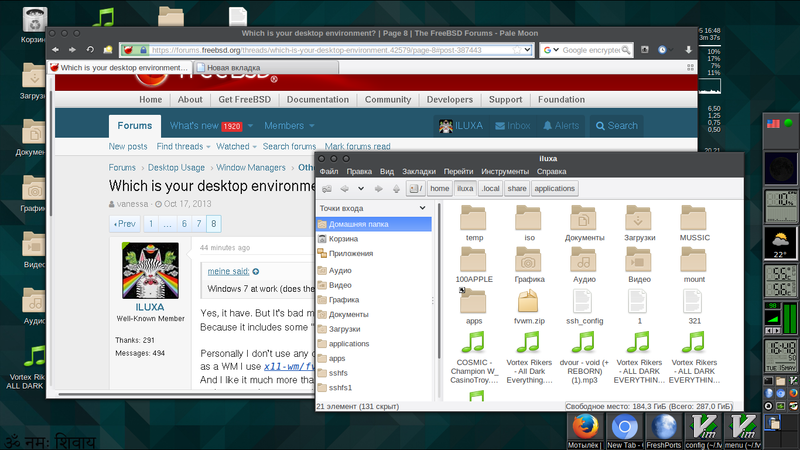 Previously I used the full-blown KDE (version 4) and kde5 mega-ports. On GNU/Linux systems I've been using Mate for a couple of years. Previously, Cinnamon. Im am using twm with an old .twmrc of mine. Unfortunately FreeBSDs configuration of fvwm2 is awfull. I had not the time to configure it like in OpenBSD. Also not the time to learn cwm and get used to it. The only thing I miss is the virtual desktops, but I can live with my twm configuration. I would never use a desktop environment: Wasting of resources, wasting of time. I couldn't live without virtual desktops, or rather "groups" as x11-wm/cwm calls them. I have always wanted to play with x11-wm/twm or rather its cousin that has virtual desktops: vtwm, tvwm? The configs seem pretty daunting though, much like x11-wm/fvwm. I never wanted to take the time to set it up the way I want. Lazy I guess! I like one and only one DE: KDE5. Yes, big and complex, but as far as DE's go, it is tremendously powerful. The one thing I DON'T like about it is that it looks like Windows, which I loath. Fortunately it can be configured to look differently, which Windows cannot. I tried once a little the cousins and, as I remember, were not so stable or perfect. You may try them and tell me. I have also very good experience with the fvwm2 of OpenBSD, it looks like motiv, but unfortunately it is much bigger than twm. I think, if you are happy with cwm, there is no reason to waste time with other windows managers. Soon or later I will learn to use it. I am very happy with x11-wm/cwm but x11-wm/twm is (in Linux anyway) typically installed along with x11/xorg so it's the first thing you see when you run startx. I never liked the way it looked but have seen some setups that look good. Maybe I'll play around with it one of these days. I don't like openBSD's default fvwm - I use "alt+left mouse" to move windows and "alt+right mouse" to resize windows, without regard to where in the window you click. In openBSD, none of this worked - I know it could be set up this way but the fvwm config is huge and I didn't want to take the time to learn. I use "alt+left mouse" to move windows and "alt+right mouse" to resize windows, without regard to where in the window you click. In openBSD, none of this worked - I know it could be set up this way but the fvwm config is huge and I didn't want to take the time to learn. In the early days of the OpenCDE project I used vdesk (https://offog.org/code/vdesk/) to add virtual desktops to the Motif Window Manager. Nowadays, I actually just use a modified TWM with vdesk. I have many desktops and things work quite well. I use olvwm for almost 30 years. FreeBSD removed it from the ports collection several years ago because it doesn't compile on 64bit systems and there is no maintainer, so I saved a 32bit package that I'm using since then (on both i386 and amd64). so I saved a 32bit package that I'm using since then (on both i386 and amd64). You could fork it, fix it up for 64-bit and call it ollivwm? It's based on the old OpenLook libraries, and the code is a huge mess. It assumes sizeof(*void) == sizeof(int) all over the place. Fixing it would require too large a part of my life time, I'm afraid. Thanks for the windowmaker suggestion. I read through this thread and it seems that and FVWM are the two most popular wms. I am enjoying windowmaker. I like cwm, but have reverted to jwm. Tried persisting with cwm but ended up just mapping jwm keybindings to replicate cwm, with the added advantage of easier mouse control over windows. My typical desktop layout is firefox on desktop1 that I also use a my main work area, music player on desktop2 (typically I put headphones on as soon as I sit down at the PC), desktop3 for cli (tmux, mc, calcurse, ssh ...etc. ).